I did, but it didn't listen...still snowing, and COLD! But yesterday, was beautiful, sunny above 40 and I had a great date with my friend Gail.. Some lady on the way out with a full cart said, "Don't go in there!" Here's the table...please excuse the quality, the light was horrible today! Here's the back...you can see how she did it..
She bought wood heart, Michael's or AcMoore has them. She drilled 2 small holes..big enough to get thin ribbon through..
You could use a paint pen and put the name on each heart too.. Thank you, Gail...I love them! Tonight it was time for the dreaded heart shaped meatloaf...not Mike's favorite! I hope you all had a glorious Ground Hog Day...I think it is safe to bet there will be 6 more weeks of winter! Table scape Day has been moved to Thursday...see you then! I think this year is making up for a total lack of snow last year :) You'll have some spring over the weekend they said! Heart shaped meatloaf? you are creative! What's an Auk? I must have been distracted when we learned about those in school. You're leaving us hanging on the shopping???? Nice things from Gail, so she's a shopper, too? Glad you finally met up with her, I know the weather has had you cooped up! Well, I think it's an auk...def not a Ground Hog..
and while I am here...where did you get the little bowls in your header...and what kind of soup is in the bowl? The wind is blowing here in GA...20 degrees with a wind chill of 7! (Brrr) I want some soup! 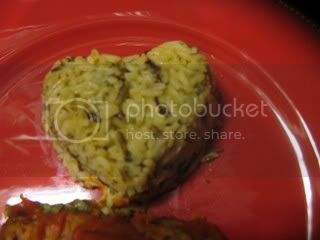 Heart-shaped meatloaf ... oh, you're such a romantic! 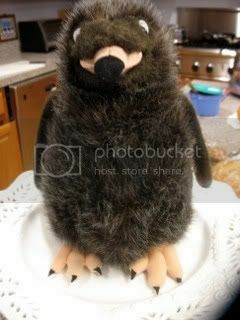 Kathleen, initially I didn't read carefully and thought, "What an ugly, strange, groundhog ..." Then I read that is was an auk. 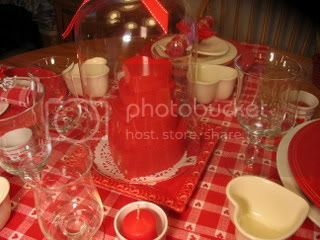 Cynthia, a gal on the Holidays forum on GW did a Ground Hog Table. It was really cute, and she had a groundhog under a dome! Go look.. I got the little lidded bowls in a chain we have called Christmas Tree Shops...perfect size..
That soup is Leek and Potato with some cheddar on top.. But I got 2 a little bigger in Home Goods, you might have a store near you? absolutely adorable! 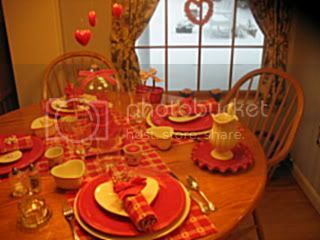 i love your table setting, great way to enjoy your snowy day! 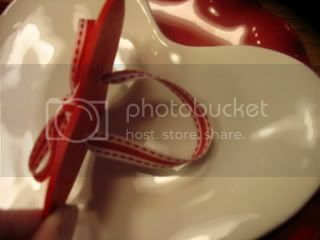 and the cloche is so cute with the hearts, GREAT JOB! very cute napkins~ you are certainly doing the show your love vday stuff, will you have enough to last 2 weeks?! Oh..... sorry WS was closed. I didn't see any signs the day before otherwise I could have saved you the trip. How was Home Goods? This is about the time when winter starts getting long and hard to take - that darn ground hog anyway! What a great friend to make napkin rings for you. 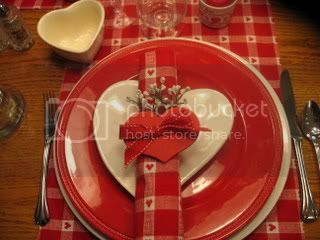 They are perfect on your beautiful Valentine table. 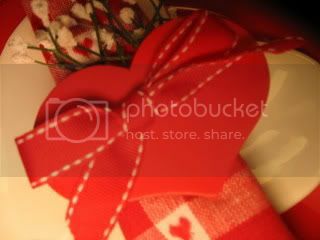 The heart boxes in the center - is that a candle? I'm seeing new things everytime I look! 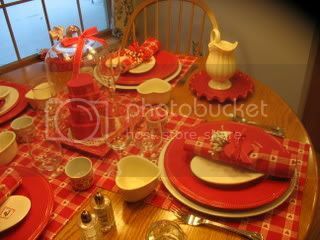 Kathleen, I love your pretty heart tablesetting... I feel the love! The meatloaf and rice are terrific! I didn't have an Auk or a Ground Hog but I'm pretty sure there is 6 more weeks of winter too! And I like your new heading pic of soup... liked the other one too! Great table Kathleen with so many pretty accessories..
Running out the door for work, so glad I checked your blog. This will give me something other than work to think about! You and Gail are so creative. Looking forward to your TT. I'll check later. 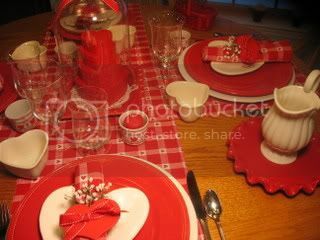 Lovely table...especially like the heart boxes under the cloche. But my favorite? 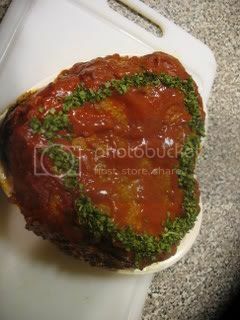 Was the heart shaped meatloaf...love the way you "framed" it w/ fresh herbs...is it parsley? I like how you start valentines day early! Does Mike appreciate the love??? :-) Besides the meatloaf that is? You cracked me up about your Auk and the baby having nightmares. 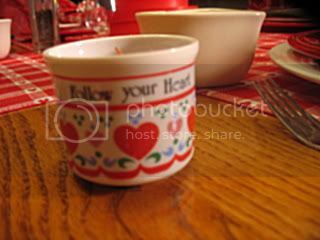 Love your heart bowls. I wish I had a basement to store stuff. I need to clean out a closet!! Ya..that's it.